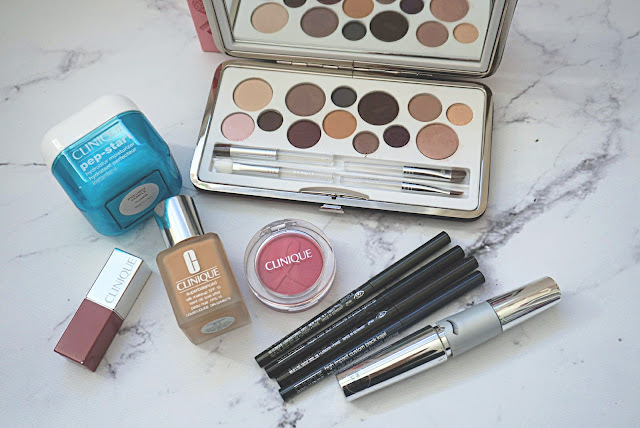 Last year, when Clinique released their cheek pops and I had the chance to try out how amazing they were, I have to admit that it was the moment I wanted to explore more into their cosmetics line. In years past, I was always a fan of their skincare, but their make-up never really captured my attention, not sure why. But since I tried out the cheek pops, I was hooked and wanted to try everything else. And to be honest, the cheek pops were just the beginning of an amazing series of make-up items that were launched (all shown above). For e.g. the Pop Lips, foundation, palette, mascara and liners. I prepped my skin with the Clinique Pep-Start Hydroblur Moisturizer* ($39), it is to me, a moisturizer and primer in one. It hydrates the skin properly and also has a feeling of those smoothing primers - the ones with the dimethicone feeling which is great as I don't need to reach for another primer to do this. 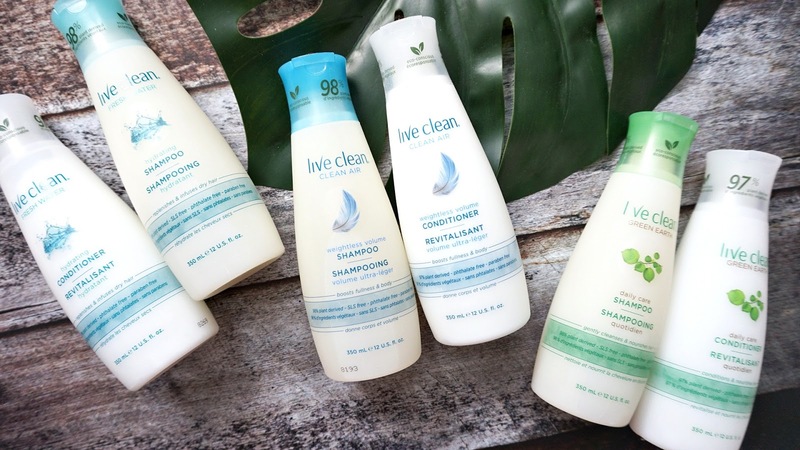 It is a great 2-in-1 product. I then applied the new Clinique Superbalanced Silk Foundation* ($33) to my face - it is a medium coverage foundation that is buildable to full. It also contains SPF which means that I do not have to worry about forgetting to apply SPF beforehand. I find that it gives a satin finish without being streaky at all. This is the type of foundation that looks better as the day goes as like the name of the product suggests, it is "superbalanced". That means that it will provide moisture to areas that need it, and absorbs oil in the areas needed to as well. For e.g. 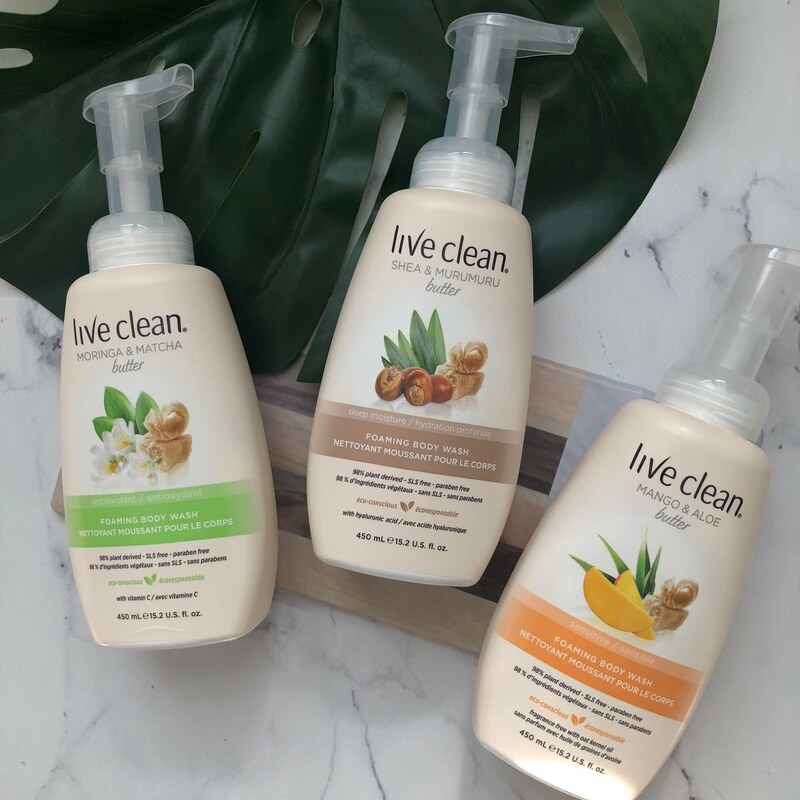 I have an oily t-zone, but when I wore this product, my t-zone never looked greasy and shiny, it just looked more "skin-like" if that makes sense. It didn't look like foundation anymore, just looked like skin. This foundation offered a flawless finish to the face and was not cakey at all. For the concealer, I actually just used a concealer brush to buff in more foundation in my dark circles. On my cheeks is the Pink with a Purpose Cheek Pop ($24) - every $4 from the purchase of this goes to support The Breast Cancer Research Foundation. 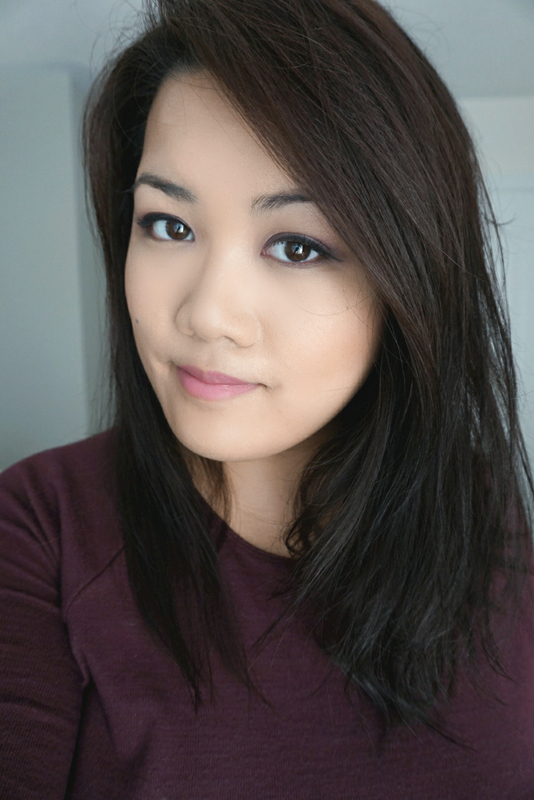 Clinique - Very Honey Holiday Eye Palette ($44) - I purchased this during the Sephora VIB Rouge sale and while the reviews on this are so mixed, I still wanted to try it out myself and see how I truly feel. There are comments that this isn't pigmented enough, well I disagree. The dark colors really deliver and they are buttery and pigmented. 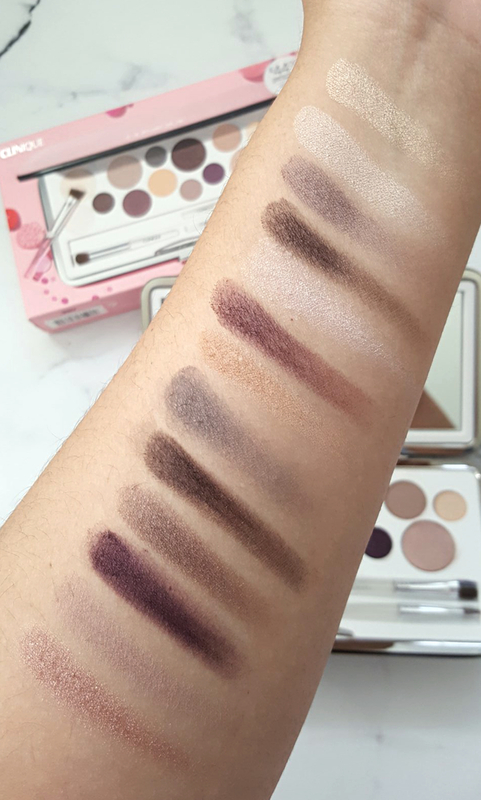 You have to realize that alot of the colors in this palette are lighter toned, so in the swatches below you will see that alot of them are light. The dark ones show up and look great and that's whats important. There's a good mix of light colors, shimmer, TRANSITION colors (key!!) and darker shadows. 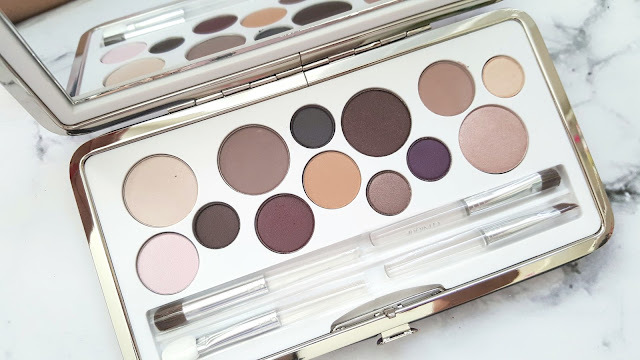 This really is an all-in-one palette and I do feel comfortable enough taking this on vacation with me or in my travel bag to achieve any look I want. 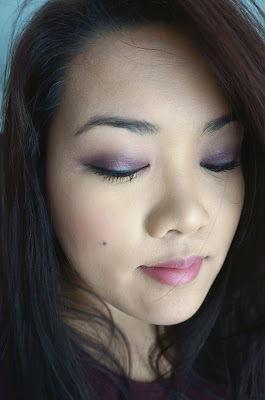 My go-to's are purple or brown neutral looks so this is perfect. 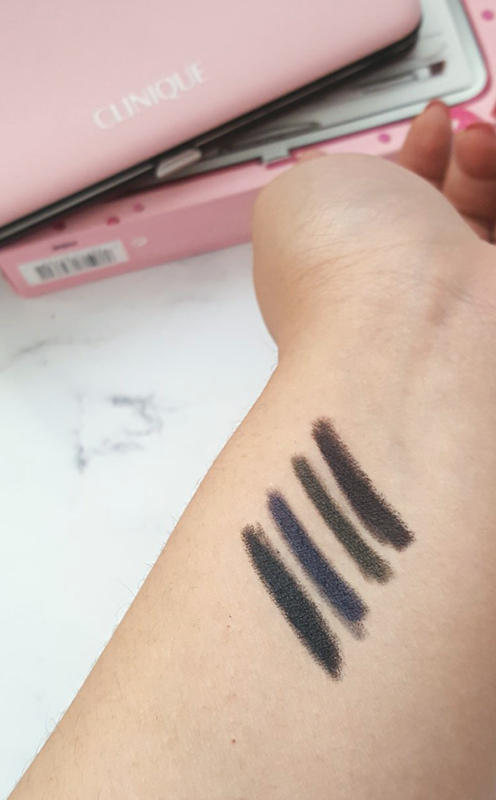 On the upper left photo, you will see swatches of the Clinique High Impact Custom Black Kajal liners* ($21 each) - from Top to bottom, the colors are: Blackened Brown, Blackened Green, Blackened Blue and Blackened Black. These when applied, gives you a few seconds of playing/smudging time. After that, it stays put, and doesn't budge. These are great along the waterline or to form a small liner along the lash line, however it is hard to achieve a very defined wing on your eye. That can easily be fixed with a make-up wipe or a liquid liner if you really wanted it. I used this to create my wing liner and I had no issues - while it wasn't as crisp and defined as I wanted, it still did the job. Clinique Lash Power Flutter-to-Full Mascara* ($28) - I highly suggest you give this mascara a go. I actually gave one of these to my friend and she loved it as well. While the concept of this mascara is a bit gimmicky - it is supposed to be able to be cuztomized to your liking - there are three settings, if you twist the barrel, it can step up your lash look, from flutter to full. I tried all three settings and didn't notice a difference but the formulation itself is AMAZING. I do not have to curl my lashes before hand and it still curls my lashes, adds volume and finally lengthens as well. It doesn't smudge, yet removes really easily with micellar water. Lastly, on the lips is the Clinique Pop Lip Colour and Primer in Plum Pop ($23) - their lipsticks are buttery, pigmented and moisturizing - this is a beautiful mauvey shade that compliments most neutral looks - i.e. 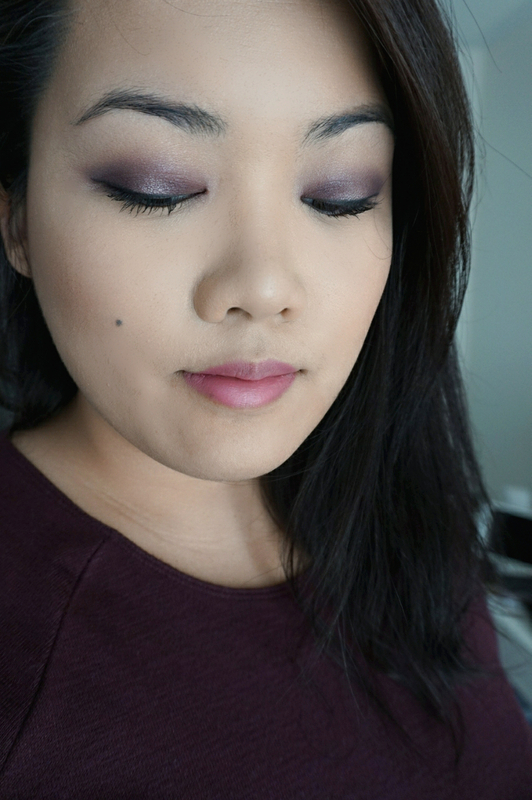 purple, brown eye looks! it's my go-to! 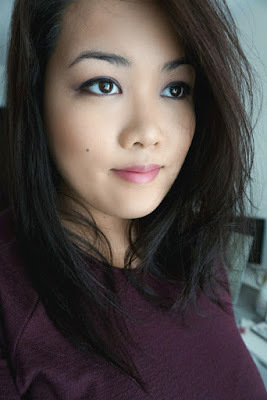 I hope you enjoyed this one-brand make-up look!